This is my friend Jeremie's One Ocean Kayak Cirrus. It is a beautiful design, and I think a little difficult for a first timer. But, Jeremie is not the type to back down from challenges. 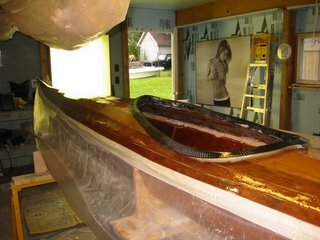 He worked through the learning curve and the boat is looking great! I can't wait to get him out in the lake with it. There is nothing like paddling a boat you built yourself! well, assuming it's not a picture of your fiancée, you could get her to imitate the pose. always good to have a muse in the workshop for inspiration.